This creamy, easy-to-make Edamame Soup with Bacon is so delicious, your family and friends are sure to come begging for seconds. Heat oil in large saucepan on medium heat. Add onions; cook 3 min. or until softened, stirring frequently. Add edamame; cook and stir 2 min. Stir in broth. Bring to boil; simmer on medium-low heat 20 min. or until edamame are tender, stirring occasionally. Add cream cheese product and spinach; cook 2 min. or until cream cheese is completely melted and soup is heated through, stirring frequently. Blend soup, in small batches, in blender until smooth. Serve topped with remaining ingredients. This satisfying soup can be prepared ahead of time. Cool, then refrigerate up to 24 hours. 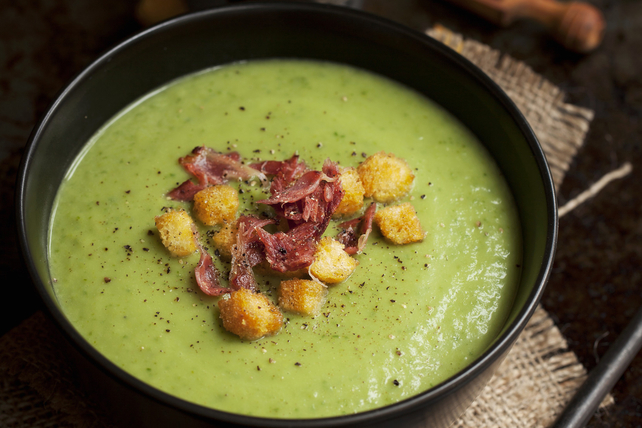 Reheat soup in microwave or on stove top just before serving topped with bacon, croutons and pepper.